One of the most exciting and adorable of all Phal. species, Phal. minus is becoming an important player in hybridizing in Taiwan for micro-miniature plants which carry the charm of the Phal. minus flower. Originally known as Kingidium minus, this species grows best mounted, along with other Phal. 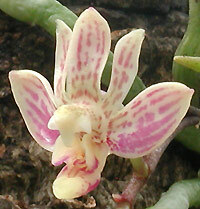 species like Phal. stobartiana and Phal. honghenensis, under lower light conditions and with ample humidity. This seedling population of the rare Phal. minus is mounted on driftwood. An must-have addition to any species collection ! Very Highly Recommended !.